On Friday, November 1st, the Middleton Police Department will join law enforcement agencies around the world in the second Global Police Tweet-a-thon. The purpose of the tweet-a-thon is to create awareness about police work and issues police face as well as to promote the use of social media in policing. In March of this year, Middleton PD was one of over 200 law enforcement agencies that participated in the first global Tweet-a-thon, when agencies across the world reached over 11 million people with 48,842 tweets in 23 different languages. Using the hashtag #poltwt, agencies trended from New Zealand west to Australia, across Europe and then from the east coast of North America in a wave across to the west coast. "Due to the feedback we received after the first tweet-a-thon, we’re offering our social media followers another chance to do a virtual ride-along and get a glimpse of the daily activity and behind-the-scenes look at a typical day at the Middleton Police Department," said Social Media Manager Keith Cleasby. "On a larger scale, we hope our participation continues to positively influence the rapidly growing acknowledgement, acceptance and use of social media by public safety agencies around the world." Middleton Police plan to share basic information about calls and activity between 3pm and 11pm on November 1st and anyone interested in following the Tweet-a-thon can follow @MiddletonPD on Twitter, like us on Facebook or go to https://twitter.com/middletonpd if you don’t have a Twitter or Facebook account. We welcome comments and questions and encourage conversation, not only during the Tweet-a-thon, but any time. 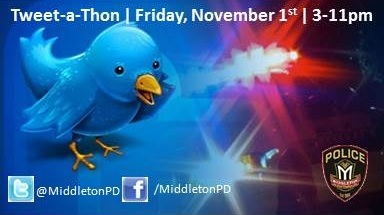 Middleton Police plan to share basic information about calls and activity between 3pm and 11pm on November 1st and anyone interested in following the Tweet-a-thon can follow @MiddletonPD [htttp://www.twitter.com/MiddletonPD] on Twitter, like us on Facebook [http://www.facebook.com/MiddletonPD] or go to https://twitter.com/middletonpd [https://twitter.com/middletonpd] if you don’t have a Twitter or Facebook account. We welcome comments and questions and encourage conversation, not only during the Tweet-a-thon, but any time.